can help make sure your kittens get the best start in life. will truly be a revelation. Your cat will adore it and carry on doing so, day after day. 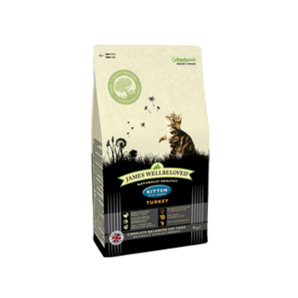 Feed James Wellbeloved Turkey & Rice to your cat and see how healthy she looks. Even fussy cats love it. Prepare to be amazed! Natural, healthy, ingredients. No added artificial colours, flavours or preservatives. Pure and hypo-allergenic. Special Omega-3 oils for a soft, shiny coat. A natural approach to urinary tract health. The same delicious taste, right across the range.